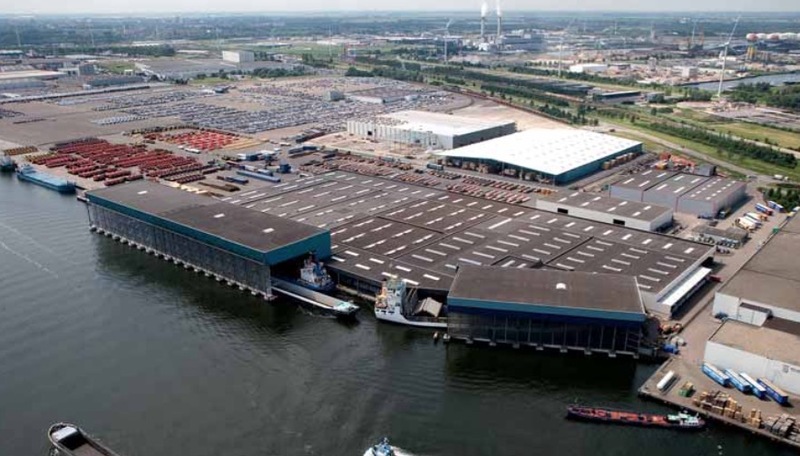 The port of Amsterdam is upgrading its port infrastructure as it seeks to consolidate and expand its role as one of northern Europe’s key dry bulk ports and industrial hubs, writes Michael King. Amsterdam’s cluster of bulk cargo terminals. The new sea lock is being financed, designed, built and maintained under a 26-year contract by the Open IJ consortium which consists of BAM, VolkerWessels and investment company DIF. It will be operated alongside the existing Northernlock, Middlelock, Southlock and small lock at IJmuiden. According to Femke Brenninkmeijer, the Port of Amsterdam’s cluster manager for Energy, the new lock will be the ‘Formula One’ of maritime locks. Dredging is already under way and full construction is due to start in July. “The new lock will be finished in 2019 and it will be the biggest lock in the world,” she said. To finance the project, the Dutch Ministry of Infrastructure and the Environment will contribute a maximum of €604 million, the Province of North Holland €56.76 million and the City of Amsterdam a maximum of €105.25 million. For the construction of the lock, a subsidy under the European Union’s European Transport Network (TEN-T) programme of €11 million has now been granted. Mark Eggens, business analyst at Port of Amsterdam, said capacity at the current lock system was already almost maxed out, so the new lock was a necessity. “It gives us the room to grow,” he added. Last year terminals in the Amsterdam North Sea region handled a total of 96.5 m tonnes of cargo. The port of Amsterdam alone handled 78.4mt (million tonnes), down marginally from 79.8mt in 2014. “We had higher revenue in 2015 at €147.4m, but volumes were down and that was mostly due to a fall in dry bulk cargoes,” said Brenninkmeijer. Coal volumes fell 10.7% year-on-year to 17.4mt in 2015, agribulk was down 5.4% to 7.4mt and fertilizer fell 8.8% to 1.9mt. Recently the Port of Amsterdam welcomed the Solitaire of Allseas at USA terminal in Amsterdam. The newly established joint venture Dutch Offshore Base (Ter Haak Group and Zwagerman Offshore) organized the replacement of a 350- tonne-capacity crane with an 850-tonne deck crane with the heavy lift crane barge Conquest MB1. The opening last year of Israel Chemicals Ltd. (ICL) new European Shared Service Centre office in Amsterdam has also boosted the port’s position for fertilizer and chemical business. ICL has a long-standing relationship with the city and has been operating a fertilizer plant in the Amsterdam port area since the 1980s. The new ICL Shared Service Centre office will provide a range of corporate support for its minerals, food and agriculture business services, including finance, procurement and human resources. “ICL opening its Shared Service Centre office has added volume but also emphasizes the attractiveness of Amsterdam port and city as a European business hub,” said Eggens. “This is our strategy for the port.We want to be more than a transit port, we want to work with the market to create added value for the region. In conclusion, the port of Amsterdam is looking to the future with optimism. The opening of the new lock system will dramatically increase the port’s annual capacity, and the lack of dependence on tides means that the port will be open 24 hours a day. Continued development and improvement at the port will keep it busy and relevant for many decades to come. Beco sells and manufactures C. Klein International attachments for excavators and wheel loaders from 10t and more; these products are used to handle a range of commodities, including coal. C. Klein International BV (CK) and BV Beco have partnered with regard to engineering, manufacturing and sales of CK attachments for construction and mining machines with an operating weight of ten tonnes and more. Through this collaboration, Beco has acquired the exclusive rights to manufacture and to sell the corresponding CK attachments worldwide. Kees Klein’s original company, C. Klein Graafwerktuigen BV in Rotterdam, developed in-house, manufactured and sold the well- known CK attachments until November 2015. C. Klein Graafwerktuigen BV, the specialist in buckets, bonus buckets and other attachments for ‘big’ wheel loaders and rock buckets for ‘large’ excavators, has a long history and has built a big reputation in the world of handling of bulk materials, including coal. The CK attachments find their distinction in design, materials and the way they are manufactured. Characteristic of the CK attachments are the high degree of filling, low fuel consumption while filling, maximum reliability, durability and safety. In 2014, the ‘New Generation’ CK attachments were launched where the aforementioned characteristics are better reflected. The collaboration combines the strengths in the areas of engineering, production and sales. Kees Klein and Leon Klein focus in this co-operation on the engineering while Beco takes the sales and manufacturing on its behalf. Kees as well as Leon Klein have very much experience in the segment of buckets and bonus buckets for the ‘big’ wheel loaders and rock buckets for ‘large’ excavators. In addition, Beco has a modern production facility with large capacity and high flexibility. relationships in the future,” said Kees Klein. “For us, the segment of handling bulk goods is an important sector. We supply besides attachments for excavators and wheel loaders also hydraulic and mechanical grabs. Through this partnership we are able to create synergy benefits and added value for our customers,” said Henk van Vuren (CEO of Beco). For repair and overhaul of the relevant CK attachments the customer can contact Beco. Beco has also the necessary technical (material) specifications and drawings. By partnering with Kees Klein the customer is assured that the revision is carried out in accordance with the original design and material specifications and so the relevant bucket retains its original properties. Zeeland Seaports is banking on a major dredging project to boost its coal volumes, writes Michael King. Zeeland Seaports expects the dredging of the River Scheldt to help its stevedores attract more coal cargoes following the closure of a power station at the port last year. Zeeland Seaports, which encompasses the ports of Vlissingen and Terneuzen and offers access to the North Sea via the Western Scheldt, currently boasts a maximum draught of 16.5 at Vlissingen and 12.5 metres at Terneuzen. But boosting the maximum draught to 17 metres is expected to make the port’s coal handlers more competitive when it comes to attracting all- important Capesize vessels. leaving a sizeable hole in the port’s coal volumes which fell to 4mt (million tonnes) last year. The station generated some 1mt+ of coal imports each year, primarily handled by Ovet which has terminals in both Terneuzen and Vlissingen as well as an active fleet of floating cranes operating throughout the Western Scheldt. “For coal throughput this year, Ovet is now looking for new niches they can serve so they can keep volumes up,” said Faes. “One of the most important competitive factors is draught. We’ve been working with the Dutch/Belgian government for some time to increase the draught of the Western Scheldt from 16.5 metres to 17 metres. This means dredging as well as introducing dynamic keel-clearance. “It took a lot of time to convince Dutch/Flemish Scheldt Commission (VNSC), a co-operation body run jointly by Belgium and the Netherlands, that we need this, but the decision has been made to proceed, and we hope it will be executed this year. Francesco Faes, Commercial Manager, told DCI that EPZ’s power plant at the port closed down in the last quarter of 2015 . We are continuously working together with the Dutch/Belgian Governments in different ways to improve nautical access to Vlissingen Port. Now we’re permitting and once it’s permitted we will start to do the dredging and support work. Last year terminals at Zeeland Ports handled 33mt of cargo in total. The loss of coal throughput was the main reason the port recorded a drop in dry bulk traffic — from 10.7mt in 2014 to 10.3mt in 2015. Coal imports shipped via Zeeland are mostly onward shipped by barge and rail to power plants in Germany or, in the case of met coal imports, consumed by local steel manufacturers. The port’s other major dry bulk commodity is fertilizers and this commodity has a very different pattern of distribution. Last year Zeeland handled some 4mt of fertilizer. Much of the cargo is handled by Verbrugge Terminals which has a facility in Terneuzen from where the cargo is distributed around the Netherlands and to the rest of Europe. Unlike coal imports which could be impacted in the long-run by falling demand from Germany as the country weans itself off coal-fired power, the long-term outlook for fertilizer demand is more buoyant. “In the long run we believe fertilizer will be in increasing demand as the world population increases and more and more people are eating meat which needs need more fertilizer compared to grains,” explained Faes. He expects fertilizer at the port to stabilize this year after a 5% increase was recorded in 2015 compared with 2014. The port’s fertilizer business was given a major boost last year when Vlaeynatie opened a new terminal, primarily to handle incoming volumes for Plantacote, a subsidiary of SQM Vitas which has built a production facilities on Axelse Vlakte in the port area of Terneuzen and plans to distribute its products worldwide. “We now have more competition for fertilizer cargoes which is always good,” said Faes.“We also of course have Yara Sluiskil’s huge plant on the Ghent–Terneuzen canal and Rosier operates another production plant. Another new arrival at the port is Bulk Terminal Zeeland which offers customized solutions for bulk processing and storage from its terminal in Vlissingen including specialized distribution and transshipment options. The five- hectare terminal offers draught of 11.5 metres and a 225-metre quay. “They are looking for minor bulk commodities and currently handle some grains, some metals and ores, alloys and metal residues etc.,” said Faes.“They are a good addition. “Also the bulk division of Pacorini Metals in Vlissingen, which handles a.o. ferroalloys, is expanding. Damen Yichang Shipyards has commenced construction of two identical Crane Barge 6324 vessels. Designed as a particularly cost-effective transshipment platform, the barges are being built on a speculative basis in response to client demands to ensure short delivery times. Damen’s Crane Barge 6324 is a low- cost transshipment barge designed for ship-to-ship, ship-to-barge or ship-to-quay operations. The design is also suitable for flexible harbour services being able to transship dry bulk, containers and breakbulk. The 63-metre-long vessel boasts 750m2 of deck space, with additional below-deck lashing stores. To ensure an optimally efficient design, Damen’s in-house Product specialists have collaborated with numerous other departments within the company. For example, the jib rest has been optimized to provide greater safety during transshipment and, alternatively, for servicing sheaves of the crane. Both Crane Barges will be installed with a Liebherr CBG 350 crane — providing efficient loading capabilities with grab operations of 35 tonnes at 36 metres and hook operations at 45 tonnes at 36 metres. The double drum mooring winches are positioned in such a way to enhance safety during mooring operation and minimize the potential for hazards. Damen’s roots in the production of workboats comes out in the detail, fulfilling the company’s goal of delivering high quality, reliable and easy to operate and maintain vessels. Industrial rubber sheeting may not sound particularly exciting but in actual fact it is widely used across the Netherlands in the agricultural industry as well as a many other industries for a wide variety of purposes including chute lining, conveyor skirting, screening and wear and corrosion protection. For some years now, the market for rubber sheeting in Europe has been dominated by Asian imported product, especially from China. But if Netherlands-based Dunlop Conveyor Belting has its way then that situation could well be about to change as they have recently launched a brand new range of Dunlop Ultima rubber sheeting. Dunlop’s strategy is based on offering a top-quality European manufactured product that is competitively priced, totally safe to handle, long-lasting and which has an order and delivery system that is flexible, fast and easy. The company believes that this combination will be more attractive than imported rubber sheeting from Asia with all the associated quality, logistical and commercial issues. Dunlop feels that it also has a number of other advantages .To make the ordering process quick and easy, the company has created a dedicated Internet website and on-line payment system. The website allows customers to select the products and quantities they want to order and even calculates the cost of delivery based on the post/zip code. Orders are then fed directly to a specially adapted warehouse in Holland for the fastest possible turnaround.